We have science on our brains. Photo of my (Paige Jarreau!) and Becky Carmichael, Scientist Selfie research team members. To Selfie or Not to Selfie - Can Scientists Foster Public Trust on Instagram? Love Science? Love Selfies? I'm collaborating with a group of researchers and science communicators to explore how scientists on Instagram might be able to change public perceptions of scientists by humanizing their IG posts. Including, yes, through the infamous selfie! We are currently crowd-funding this research project at Experiment.com (launching Wed, August 9, 9am cdt). Please come Experiment with us! Learn more and give what you can at experiment.com/scientistselfies. According to Pew Internet data published in August 2015, 55% of online adults ages 18 to 29 use Instagram. Roughly 32% of internet users are using Instagram, with a high percentage of users being younger adults and teens. What's more, an increasing percentage of young audiences (under 34 years) are getting their science news from online-only sources, and online media today revolves heavily around photo and video sharing. But Instagram might be more than an new avenue for engaging young adults and teens in science with visuals. It may also be an avenue for helping these users see scientists differently. You see, scientists may have an image problem after all. Scientists need the public’s trust as disseminators of reliable and pertinent scientific information, but to earn this they need to demonstrate a shared value system and engage people’s emotions (Fiske & Dupree, 2014), not just their brains. Trust and credibility of scientist communicators and their messages are important in that they can impact attitudes, decisions and behaviors related to scientific findings and issues of pressing public concern (Brossard & Nisbet, 2007; Rabinovich & Morton, 2012). 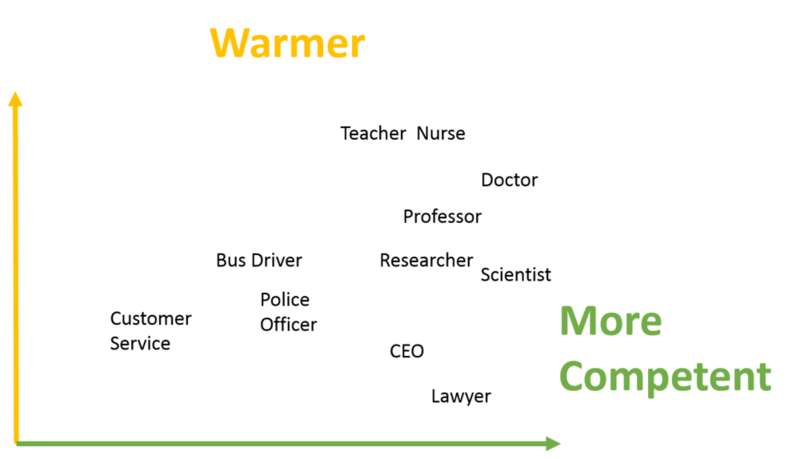 Re-draw of Fiske and Dupree’s competence vs. warmth findings (2007) for various occupations among U.S. adults. And yet, in our experience, many scientists are hesitant to join social media platforms that require them to share visual aspects of their work, expose their personalities and highlight themselves as human practitioners of science. Scientists may be especially hesitant to take “selfies.” Sharing purely scientific photos may be more socially acceptable among their colleagues. The new National Academies of Sciences report on Communicating Science Effectively identifies many of the complexities of communicating science. One of these complexities, of special interest to the team of researchers I’m working on this project with, is the public’s trust of scientists. Many factors are associated with how much an individual trusts scientists in general, including potentially that individual’s gender, age, race/ethnicity, political ideality and scientific knowledge level (National Science Board, 2016). That individual’s perceptions of scientists in general and individual scientists in particular also matters. It turns out that trust depends not only on perceptions of scientists’ expertise or competence (Lupia, 2013), but also on perceptions of scientists’ honesty, openness and morality (Renn and Levine, 1991), or scientists’ warmth (Fiske & Dupree, 2014). Both competence and warmth are critical constructs of trust, but perceived warmth often carries more weight in terms of attitudes and behaviors (Fiske, Cuddy & Glick, 2007). ‘‘First, actors need to anticipate others’ intentions toward them; the warmth dimension – comprising such traits as morality, trustworthiness, sincerity, kindness, and friendliness – assesses the other’s perceived intent in the social context’’ - Cuddy, Fiske, & Glick, 2007, p. 63. PhD student Julie Butler taking a selfie with her fish neuroscience lab's "lucky charm" at LSU! Instagram might be an avenue for changing people’s perceptions of scientists. Instagram is (in)famous for promoting a “selfie” or self-portrait culture. Faces engage us. Researchers at Georgia Tech found that Instagram photos with faces are 38% more likely to receive likes and 32% more likely to receive comments than photos without faces [PDF]. Humans simply make stories more shareworthy. Milkman and Berger (2013) found that scientific discoveries referencing people were more likely to be shared, in terms of a 5% increase in raters’ self-reported willingness to share a scientific summary. We know that smiling faces make people appear more friendly, approachable and trustworthy in images, but the effect can be different for different people, such as for men vs. women. Instagram practices (such as posting selfies) may boost the perceived warmth but hurt the perceived credibility of female scientists but not male scientists, for example. “Female academics in the sciences are perceived as less competent and more warm than their male counterparts” (Young, 2011). Attractive or feminine women who post self-portraits on Instagram may elicit responses of “But You Don’t Look Like A Scientist!” reflecting gender stereotypes. Unfortunately, we know little about how the presence of a human face in images taken in scientific contexts impacts perceptions of scientists, especially in the context of social media environments. Hannah Hayes is a wildlife biologist - she works with bats, as an environmental consultant. She took this AWESOME bat #scienceselfie and sent it to us on Instagram. We also know very little about the extent or type of science-related content currently being shared on Instagram. We know from Pew data that photo and video sharing have grown in the past few years, and Instagram audiences appear to be more diverse than Twitter audiences, Reddit audiences or the audiences of many other social networks. So, it's a shame that we know so little about the #science Instagram world from a scientific perspective, or what effects scientists’ Instagram posts are having or could have on Instagram users. That’s where our team comes in! We are a team of science communication researchers interested in collecting data on how Instagram posts can change people’s perceptions of scientists (or not). Our team includes myself, Dr. Lance Porter at the Manship School of Mass Communication at LSU, Dr. Becky Carmichael at LSU’s Communication across the Curriculum, CxC, Daniel Toker at the University of California, Berkeley, Samantha Yammine at the University of Toronto in the Department of Molecular Genetics, and Imogene Cancellare at the University of Delaware in the Department of Entomology and Wildlife Ecology. We all run popular (more or less!) Instagram accounts where we share STEM and science communication research. Follow us as a group @scientistselfies! We plan to test whether a series of scientists humanizing themselves on Instagram (posting friendly photos of themselves in scientific contexts) and interacting with their followers may enhance perceptions of scientists’ warmth. (You’ll remember that warmth is a key component of trust, and trust in scientists impacts trust in scientific information generally, perhaps especially info communicated directly by scientists in social media!). We also want to explore how viewing scientists on Instagram may change stereotypes about who can be a scientist, in the process inspiring a new generation of diverse scientists. Images posted to Instagram by scientists who took Paige and Becky's LSUSciFund Instagram for Scientists course in February! The overall goal of our project is to explore how scientists presenting themselves as human on Instagram impacts viewers’ perceptions of their warmth (related to perceptions of morality, honesty, sociability and openness) and competence, and whether the impact is the same depending on a scientist’s gender, for example, based on gender stereotypes. We will conduct studies employing multiple methods, including (1) an observational study of scientists’ use of Instagram, to explore relationships between visual characteristics of posts and viewer engagement (comments, likes, etc); (2) a lab experiment to explore causal links between humanizing aspects of scientists’ Instagram posts and viewers’ perceptions; and (3) a similar online survey experiment using a broad sample of Instagram users and/or U.S. adults. For our experiments, we are working with scientists experienced in using Instagram to create realistic stimulus materials. We've already collected dozens of image series from over 50 real-life scientists to use in our lab-based and online experiments! We will ask participants to rate the warmth and credibility of the Instagramers as well as scientists in general, among other related outcome measures, after they browse controlled Instagram content. Participants will be debriefed following experiments and directed to follow the real scientists upon which the stimulus content will be based. We expect this project to build scientists’ capacity to foster public perceptions of warmth as well as competence through visual social media posts, and to foster their use of evidence-based strategies for engaging the public with science on Instagram in ways that promote trust. The outcomes of this research project will be focused first and foremost on helping scientists better communicate their work! In addition to a traditional peer-reviewed publication, we will produce an open-access, evidence-based guide for how scientists can present themselves on Instagram effectively, to build trust and disseminate information widely and effectively. Image credit: Sue Pillans, drsuepillans.com. We will be creating a Creative Commons image bank of scientists in the lab and field, which will include all the images that were submitted to us by over 50 #actuallivingscientists, and any further images we collect for this study. With the researchers’ permission, these images will be made available to science journalists, bloggers and other science communicators looking for compelling images of real scientists doing science! We are also creating a public index of scientists on Instagram, via this Google form! Anyone can see and follow these Instagrammers at bit.ly/IGscientistsindex, and we may pull from this list for a future study of scientists’ Instagram practices and content. Finally, we will be feeding our results (and the mobile devices we are requesting via Experiment.com to use in our lab-based experience) back into training the academic and scientific communities to more effectively communicate their work on social media! This training includes an online LSUSciFund course on Instagram for Scientists slated for February, 2018 (find info on our 2017 course here). Scientists who take the course will be able to "rent" our mobile devices for free, to capture images and videos in the lab and field! Are you ready to help us out? Because to conduct this research and produce all of these outcomes, we need your help! Please visit our project page at experiment.com/scientistselfies, and pledge what you can. We don’t keep ANY of the funds if we don’t reach our funding goal. And we have some AMAZING perks for our backers, including t-shirts, science fashion boxes, personalized resume editing and social media advice services, custom scientific illustrations, social media plans and more!